Cured Meats: Pancetta - Again! I don't know if this is even worth posting, as i've discussed pancetta previously,but since I'm trying a new formula, and I haven't posted in a while, i might as well detail it. I had in my freezer a beautiful piece of pork belly from an Ossabaw pig raised by Emile DeFelice at Caw Caw Creek, which is basically the best pork I've ever eaten. I just read something that upsets me, apparently Emile will no longer be raising Ossabaws for slaughter. What a shame. Ossabaw pigs are basically feral pigs, and are much fattier than their commercial cousins. They're tremendously flavorful. Here are the cure ingredients. The stuff that's already powder is in the bowl on the left. In the middle top is the black pepper corns, and on the right top, the bay leaves. On the bottom row are the myrtle berries. These are the berries of an evergreen shrub that grows around the Mediterranean. I'm not sure if they're available here in the US, i brought them back from Italy. They taste quite similar to juniper berries, and you can substitute that for them. Everything gets ground, pretty coarse, and mixed well. All the rub gets applied to the piece of meat, and massaged into it well. Make sure you get some on all sides. It's important to use all the curing salts, since the percentages of salt and curing salts are based on the weight of the meat. Just massage it all into the meat, and put it in a non-reactive container. It'll stay like this for 10-15 days in the refrigerator. I'll massage it a few times, and then off to the curing chamber! I'll let you know how it turns out. I'm pretty sure it'll be excellent. Joe, the berries are the ones used in liquour making, they're called "mirto" in italian. Thanks for the information, i'll do some more research and correct as necessary! I have your previous recipe for Pancetta hanging in my basement. I can't wait to give it a try in two to three weeks. I have a space under my stairs in my bi-level house which maintains a fairly constant temperature of between 50-55 degrees, but the humidity is lower than the recommended 65%. Are there any cured meats which could be made in this space without additional humidification? Will it make other things that i store there smell like meat? My dog would like that, but my wife probably not so much. Jack, you could try a pancetta. It normally does pretty OK at lower humidities because it's thin. And, probably yes, other stuff will smell like spices and meat most likely. I have a fairly dry basement this time of year and I found that an open pan of water can help increase the humidity. It is a careful balancing act to get it right so try smaller or larger diameter pans to get the right percentage. Also hanging a moist paper towel that sits in the pan of water can also increase the surface area and moisture. Be careful and check on it daily until you get the right balance. You would hate to ruin a good pancetta or prosciutto. this response is for Joesan. The two berries mentioned are very different from one another. "Mirto" berries are Myrtle berries, "Mirtilli" are plain Blueberies. I was told that our California bay tree produces berries that can be sustituted for mirto berries. I have seen them but never used them. I hope this info is useful. I have a question. I am using your old pancetta recipe and it is starting to firm up nicely. I did notice last night that there are small white spots starting on the meat. I have it in there with my Bresaola which is getting a nice layer of white on it. Should I be concerned for my pancetta? Bruce, a little while mold is OK. You can wipe it with a water/vinegar solution at 50/50 if you like. I get mold on the pancetta after it's been in the fridge for a while, i just scrape it off and use it. On another forum or post somewhere you mentioned that using the fridge as your cure-house is just fine. I would like to go for the pancetta recipe WITHOUT the cure salts. Considering the meat would be inside the fridge (our garage fridge) for weeks, shouldn't this be a safe bet? Randall, i think if it's refrigerated the whole time, and given that it dries fairly quickly given the surface area, not using the curing salts SHOULD be OK. It won't have the nice dark red color though, and the flavor will be slightly different. I've done it without cure myself, it's fine. I tried my first pancetta and unfortunately it got a lot of multi-coloured mold on it. The humidity and temperature were right in the sweet spot so does anyone know why it might have happened and what I can do so it doesn't happen again. I had it in my curing chamber with a bersaola would that have made a difference? Also what do juniper berries offer? Do they help to preseve and cure the meat? Bruce, sorry to hear that about the pancetta. I don't know of any perservative powers of juniper berries. Was the meat fully cured (in the salt long enough) before you hung it? I think Mrytle berries are the ripe fruit from clove buds... yes? And regarding the Bay leaves... my Itlaian neighbor brought a Laurel plant from Italy and now it's 8 feet tall... We love the richness of the leaf, but it has NEVER produced a berry. I love fresh bay leaves, i need to find another plant. "Emile will no longer be raising Ossabaws for slaughter"
That's really too bad. Although I have never bought from Caw Caw Creek, I certainly have A LOT of respect and interest for all those who do raise these very, very rare coastal Georgia hogs. Any idea why they are no longer raising these hogs? Where did you read about it? i haven't confirmed with Emile, but it would seem like a weird thing to make up. i guess it's theoretically not strictly necessary to refrigerate it, but i would. It won't hurt it, and it'll probably keep better. Looked for a lardo blog, but didn't see one. Do you have a t&t recipe for lardo di colonnata or similar. I was wandering if you know of farms in Illinois from where I can purchase fresh pork belly for pancetta. Chris, i haven't made a lardo post, i'll do one shortly. I've been reading your posts and I'm really impressed. What a great reference for making your own cured meat!if you won't mind I'd love to guide foodista readers to your site.Just add your choice of Foodista widget at the end of this blog post and it's good to go.Thanks! welcome back! I was wondering if you drain off any liquid that comes out of the pork during the cure stage? Pietro has sought out traditional recipies and techniques before they are lost so it is a wonderful endeavor he has made. Taters, i don't drain any liquid that comes off. thanks for the link. The book looks interesting. I'll have to see if i can get it in the US without paying for some crazy shipping fee! I have followed your recipe above with the addition of Cure #2 and it is in the fridge curing as i write. However, after a bit of googlewhacking i am a bit concerned about the nitrate used in the curing salt and it's associated risks when the final product is cooked at high temps (which i expect to do!). What are your thoughts on this and sorry if i'm repeating any old posts that i may have missed. Miles, meats cured with nitrite and which are cooked well done do form nitrosamines, but it's unclear what amount, if any, is harmful to humans. Given that i don't consume massive amounts of fried pancetta, and when i do eat it, i don't burn it, i'm not that concerned. Hi Jason. Thanks for your info on the nitrosamines. My Pancetta has been curing for 9 days now and i was hpoing you could have a go at answering some other questions for me. I'm really exciting but i just want to know more! 1. I have used cure #2 as stated in your recipe. This contains Nitrate as well as the Nitrite i asked about. Will these break down to Nitrites whilst the meat cures and do they have any associated health concerns. 2. My pancetta is much firmer than when fresh but still a bit squidgy. How can i judge when it's done as I don't know of any firmness scale! 3. My fridge runs at about 8c and 55% humidity which i'm thinking is good enough but i only have 1 fridge so would have the meat uncovered with all my other food in there. Is this acceptable? Sorry there are so many questions Jason and i understand if you don't have time to answer. This curing experiment is just so interesting!!! 1) Given the long drying time, the nitrates should break down to nitrites. I don't know of any health concerns. 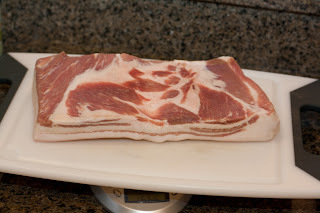 3) Pancetta will work well in a regular fridge, that's not a problem, and also leaving it uncovered is OK. Just put it on the bottom shelf and out of the way so other stuff doens't come in contact with it. Put it on a cake rack over a plate so the air can circulate around the piece and dry it. Great stuff... Thanks Jason. I just can't wait to eat it now, 3 frustrating weeks coming up! I don't know if you have heard of Mynard Davies. He's a bit of a legend in the British curing world. I have read his autobiography which is excellent fun and i'm hoping that there are some great recipies in this book. I shall let you know. That book looks intereting Miles, thanks. I'll have to add it to my list to take a look at it. Just cooked my first slice of Pancetta. Oh yes.... So full of flavour, just amazing. Might eat the rest of it today! Thanks for all the info, it was a great help. The meat is a lovely colour and nice and firm. Great fun... Thanks again. Glad it came out well Stiggy! Whatever happened to the results for this one? How did it turn out compared to your last one in 2008? no clue...it was 5 years ago! My ultrasonic humidifier is broken!